Myself along the Manayunk Canal. Photo by Ken Januski. A year ago I broke down and bought some snowshoes, then a short time later bought some more for my wife Jerene. I knew that this would almost guarantee that we would get no snow last winter and probably for the next 5-10 winters. But no, we were able to get out a few times last year. 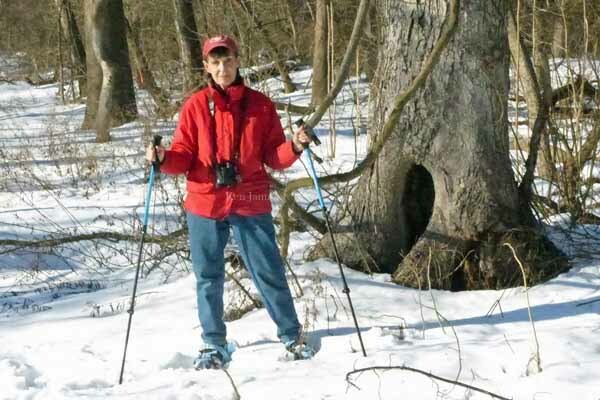 At other times just the poles by themselves proved helpful when hiking icy ruts. Jerene along the Manayunk Canal. Photo by Ken Januski. Unfortunately we were not able to get out during our recent snowstorm/blizzard. Then finally today we made it to the Manayunk Canal, where unlike many areas, there was still a lot of snow on the ground. Above you see both me and Jerene. The camera was misbehaving so they're not the best photos but at least they show some documentation of our snowshoe birding. Though we'd hoped to see some winter waterfowl, especially along the Schuylkill River, there wasn't anything unusual. But we did see four Common Mergansers and three Hooded Mergansers, the first of 2016. Seeing them is always a sign that winter really is here! 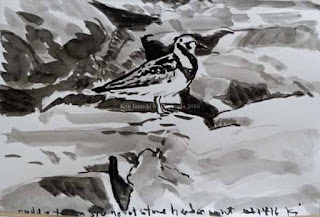 Ruddy Turnstone at Stone Harbor jetty. Brush Painting by Ken Januski. Just as we've been too busy to enjoy the snow I've been too busy to do any artwork. But I found an hour a day or two ago to do this brush painting of a Ruddy Turnstone seen on a jetty at Stone Harbor, NJ last May. I continue to enjoy working with a Chinese brush and ink stick. Common Mergansers on Schuylkill River. 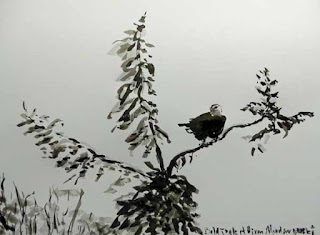 Chinese Brush Painting by Ken Januski. Pileated Woodpecker and Northern Flicker Eating Poison Ivy Berries. 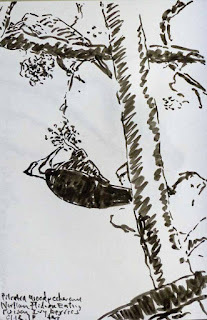 Sumi Brush Pen Sketch by Ken Januski. Last Saturday was the annual Philadelphia Mid-winter Bird Census and we took part once again. Unseasonably warm weather, and a totally overcast day, made for an odd count. 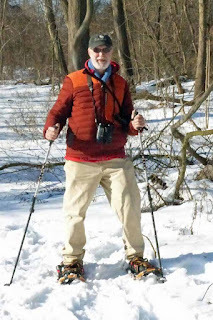 Outside of seeing and hearing a Common Raven flying over the Schuylkill Center for Environmental Education we didn't see much unusual and to some extent we didn't even see the usual. But we did see our first Common Mergansers of the year, pictured above riding the waves of the Schuylkill River. We also saw four species of woodpecker eating poison ivy berries from the same tree, around which the poison ivy had wound itself. I'm still stuck on Chinese brush painting, not a bad thing to get stuck on, but something that I don't want to make a lifelong detour from my other work. But for now my idiosyncratic, and some might just say bad, combination of western style and Chinese brush painting style seems a useful and informative way to make pictures. My hope is that eventually what I've learned from brush painting will manifest itself both in my prints and in my watercolors. And hopefully I'll get better at it in itself, though given that you could spend your life studying it I don't have high expectations. The mergansers are painted with ink made from an ink stick and water, which allows me a variation of blacks and grays. 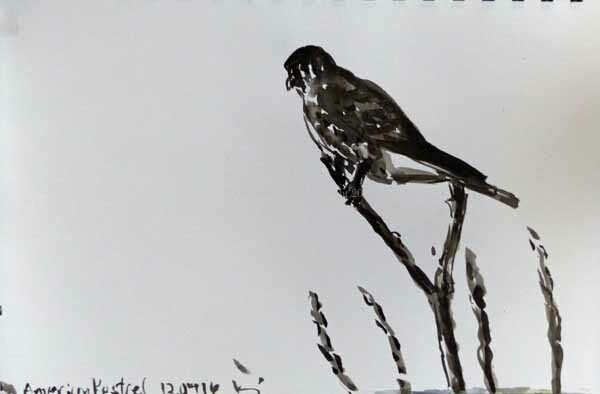 I used a small Chinese calligraphy brush and a larger sumi brush for it. The Pileated Woodpecker and Northern Flicker was painted with a Kuretake Sumi Brush Pen. The virtue of it is that the ink is carried in a reservoir, like a fountain pen, but it cannot easily create more than one color, a deep black. Bald Eagle at Dixon Meadow Preserve. 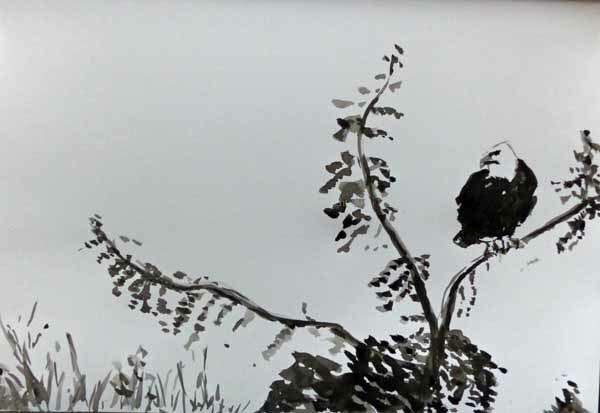 Chinese Brush Painting by Ken Januski. Northern Harrier at Dixon Meadow Preserve. Sumi Brush Pen Painting by Ken Januski. Well at least it seems like the Year of the Raptor, based on the birds we've seen in 2016: a Bald Eagle at Andorra Natural Area and Dixon Meadow Preserve, probably the same bird; a Northern Harrier twice at Dixon Meadow Preserve; two American Kestrels at Dixon Meadow Preserve; and an accipiter(either Sharp-shinned or Coopers Hawk) in our backyard over the last two days. American Kestrel at Dixon Meadow Preserve, Chinese Brush Painting by Ken Januski. I hesitate to talk about Oriental brush painting, Chinese brush painting or sumi-e, since I know so little about each. 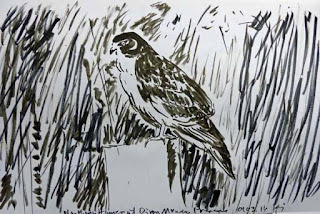 What I do know is that I used a brush called a Kuretake Sumi Brush Pen in the painting of the Northern Harrier. When that pen ran out of ink and I didn't have time to refill I switched to a brush pen of another brand, Pentel I think, but possibly Pilot. I also know that I did take a one semester course in Chinese Brush Painting many, many years ago. I greatly enjoyed it, and realized how complicated it is and how much skill is involved. And I know I never have studied sumi-e, which as far as I can tell, is the Japanese equivalent of Chinese Brush Painting. But I could very well be wrong since it seems to accentuate a simpler and more spontaneous use of the brush. Perhaps it is just one type of Japanese Brush Painting. Who cares you might ask? Well anyone who actually knows something about sumi-e or Chinese brush painting probably does. So I'm trying to be as accurate as I can be, given my slight knowledge. When I did study Chinese Brush Painting I do recall that I preferred Japanese brush painting as far as I could tell. Japanese seemed bolder and less conventional, harder than the softness of Chinese brush painting. Today my tastes have changed and I'm more appreciative of Chinese Brush Painting, again with the caveat that I don't know much about either. To further complicate things my recent interest in both stems largely from ukiyo-e printmaking, again a Japanese art. As I looked at some of it over the last few years I've realized how elegant and rich the black outlines of so many of the shapes are. Those outlines are rarely just one undifferentiated width. They are light and dark, thick and thin, etc. This gives a real vitality to the prints, which often also have very strong colors. But the color is less important to me than the line. In particular this interest in ukiyo-e led me to the drawings of Hokusai, a master of the brush. He truly is someone who is a master of rich line. All of which leads me back to the work above. I've been using Sumi Brush Pens for almost a year now I think. I greatly enjoy them. But I have been bothered a bit by the fact that the ink cartridge can only hold one color, generally a rich black. It is difficult to get the rich variations of black and gray that characterizes brush painting of both China and Japan. 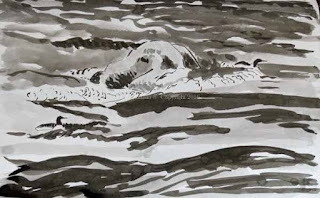 So over the last few months I've been experimenting with various sumi brushes and real sumi ink made from a sumi stick and capable of infinite gradations of gray and black. The first two sumi brushes I bought were far too large for my paper and created nothing but blobs. Finally I bought a very small Chinese calligraphy brush. It is the right size though probably not as flexible as a painting brush. If I could have found a small Chinese painting brush I would have bought it. 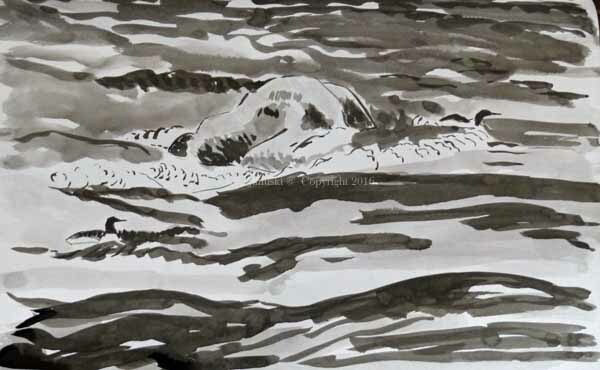 In any case three of the four paintings on this page were created with it and sumi ink created from using an ink stick and water. I realized that this is probably an impossibly convoluted explanation of how and why I did these paintings. But for the few people who read this and know something about Japanese and Chinese brush painting it will probably make sense. And, EVENTUALLY, I hope what I've learned will show up in my prints. For now though I'm still completely enamored of the brush painting itself, though I also realize what a rank beginner I must seem to those who actually know something about it.